​Navin was at the Indian Military Academy when a freak accident doing gymnastics paralysed him neck down. He regrets that the cadet who accidentally pushed him leading to his fall never came to meet him after that. “I would have liked to tell him not to feel any guilt because accidents happen. But probably he could never face me,” he once told me. He said he never thought about who had pushed him but only how would he still get on with all the things he wanted to do. Gentleman Cadet Navin Gulia of the Indian Military Academy spent many months lying on his hospital bed with a traction drilled into his skull to keep his spine straight. He spent that time making a mental list of all the things he would never be able to do. “I would never be an Army officer, I would not be able to write, I would not be able to do anything with my limbs…the list was endless,” he says. And then he performed a small act of courage. He decided that his self worth did not come from any of those things. “I taught myself to be proud of what I was. And then I started finding ways to make myself worthy of that pride.” It wasn’t easy. He hung a book from his hospital bed and started to read, practiced mental chess on an empty chessboard, dictated his answers and passed a computer proficiency course at Aptech with 99 per cent marks; had his friends carry him up the 40 stairs of Symbiosis everyday and completed his Masters Degree in Computer Management with first class. He started teaching computer science for a living, fought for a driving license and when car manufacturers did not show any interest in his hand control designs, went ahead to design a hand driving kit for the differentially abled that can be attached to any car. Who would know it better than him? When doctors pronounced him 100 per cent disabled, Navin challenged those limitations, and strived relentlessly to achieve whatever targets he set for himself. Though Navin has no sensation below his shoulders, he has taught himself to drive cars and motorised gliders. “With practice you can do anything,” he says, “I was never afraid of hard work”. He has designed controls that let him handle an automobile’s clutch, brake and accelerator simultaneously and uses them by pushing his arm, by moving his shoulder. “Flying is easier than driving. The controls are so much less complicated. Pull the steering and the plane goes up, push it down and it comes down. Unlike a car, a plane cannot topple. So I found flying even easier than driving,” he explains. Navin has gone on to set a Limca World Record – he has driven a Tata Safari to Marsimik La, the highest mountain pass in the world. At 18632 feet, it is 1232 ft higher than the base camp of Everest. 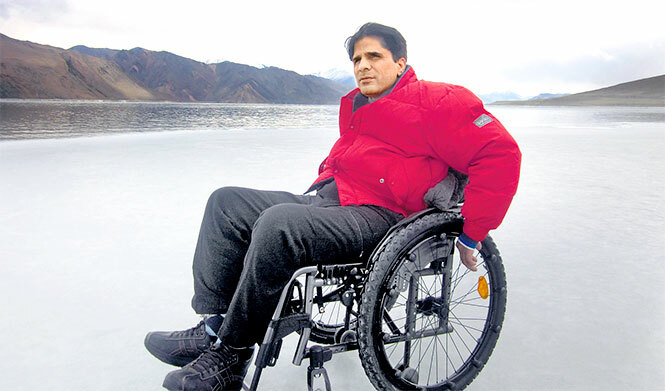 He has modified cars for polio affected people, designed controls for the differentially-abled, given motivational talks to soldiers disabled by war and insurgency, touring hospitals to share his infectious enthusiasm and will to live a happy life with the war wounded and paraplegics. Adventure Sports - Despite getting injured in the army at the age of 22, he continued his passion for adventure sports, modifying his own cars to drive and flew powered hang gliders and micro light air crafts. In September of 2004 he created a World Record in Adventure All-Terrain Driving by driving non-stop for 55 hrs to reach the world's highest motorable mountain pass, the formidable Marsimik La at 18632 feet. A record that stands unbeaten till today. Social Work - He runs an organisation called ADAA 'Apni Duniya Apna Ashiana' (Our World Our Home), for the welfare of under-privileged children from the weaker sections of the society. His organisation works for street children, village children and differently able children. His Books - He is the author of two motivational Best Sellers. His English book 'In Quest of the Last Victory' has been published by Pearson Longman and his Hindi book 'Veer Usko Janiye' has been published by Prabhat Prakashan.